Sri Krishna Jayanti marks the celebration of the birth of Bhagavan Sri Krishna. Krishna Jayanthi also called as Krishna Janmashtami/Gokulashtami is celebrated every year during the month of Avani on Krishna Baksha Ashtami. SriKrishna Jayanthi, is celebrated by preparing a lot of sweets & snacks.Houses are decorated with little feet drawn with flour paste symbolizing the entry of the child Krishna into the house. . On the evening during the sunset, devotees will do pooja for Lord Krishna and offer the Lord with butter,fruits,vella seedai, Cocunut Seedai , Appam, Thattai,Aval and some more delicious foods. Here are few recipes we make for this festival. A crispy tasty snack that’s a traditional South Indian delicacy. Thattai is a yummy savory delight prepared during many festivals in our village. 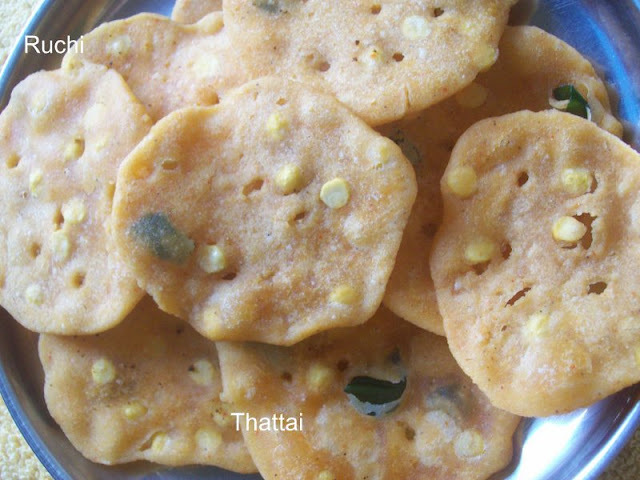 Thattai is one of the snack I prepared always at home and especially on Gokulashtami Thattai can also be served as a tea time snack. 1.Dry roast rice flour for 2-3mins. Set aside. Then dry roast urad dhal flour for 3mins. Set aside. 2.Soak channa dal in water till immersing level for 30mins. After that drain water and keep the channa dhal aside. 3.Now in a mixing bowl add rice flour, urad dhal flour, , butter, channa dal, coconut(if you are adding), chilli powder,curry leaves salt and hing. Mix well until all is combined. 4. Add water little by little to form a soft dough and knead it to a tough dough (but must be soft enough to shape it into lemon size balls). 5.Take a piece of plastic paper, spread oil in the paper, make small ball of the flour, and keep it in paper..
8.Carefully drop the thattais and Turn them to cook evenly and fry until golden brown. 10 Once cooled, store them in an air tight container. The recipe is basically quite simple. Some freshly ground rice flour, some moong and chana dal lightly roasted and ground into powder, salt, chilli powder and some hing. Some butter to give it an extra bit of crispness and make a stiff batter is made using water & is pressed out through a thenkuzhal naazhi into hot oil. . 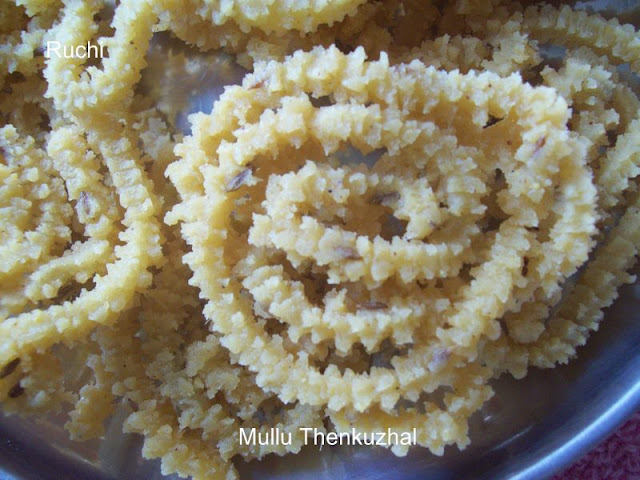 They used to be perfectly golden & crisp & really melting in the mouth.In our home and thenkuzhal/ mullu thenkuzhal is one of the favorite recipe and I make this often for many festivals. 1.Dry roast the moong dal and channa dal in a kadai. Allow it to cool. Soak Raw rice in water for an hour. 2.Drain the water & spread it on the towel to make them dry. it should be moisture Grind thi rice in a mixier into a fine Powder & keep it aside. 4.Take this very fine powder 1 cup and rice flour 2 cups in a bowl. Now add melted ghee or butter asafoetida, jeera and salt to this flour and mix well without any lumps. 5.Now add water little bit little to make into a dough consistency. 6.Meanwhile, heat oil in a kadai . 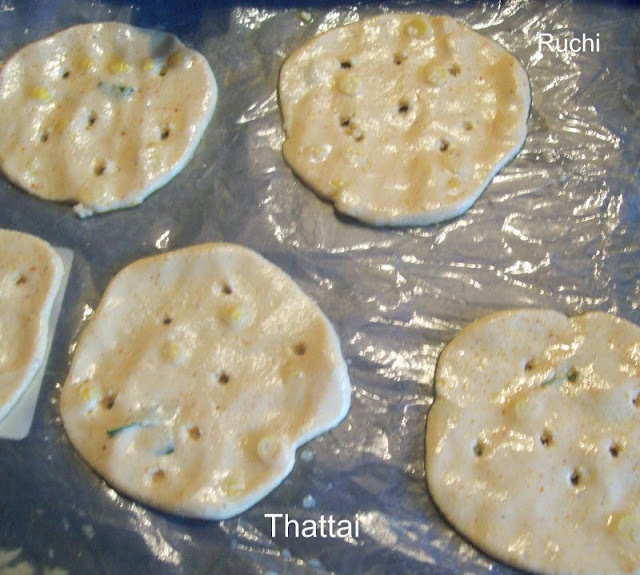 when the oil is hot enough, put this dough in the "mullu thenkuzhal" mould and press it firmly in a circular motion over the wet cloth. 7.Heat the oil to medium heat.Gently slide the murukku into the oil and fry on both side till it become light golden brown colour. 8.Drain & cool it before serving.Store it in a air tight container.